What can you do with your Eee PC? Find out how to get the most from this mini-laptop with Asus Eee PC For Dummies. It shows you how to get things done—using the Linux operating system and applications, navigating the tabbed desktop, adding hardware and software, backing up and restoring the Eee PC, and more. The Eee PC makes it simple to surf the Web, play games, work, and more. 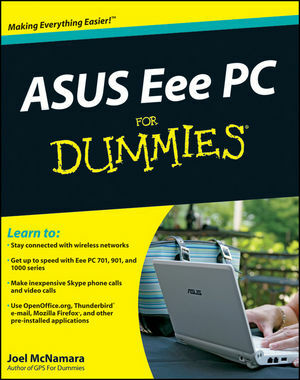 Asus Eee PC For Dummies makes it easier! Joel McNamara is a writer, technology consultant, and outdoor adventurer. He has worked in the computer industry for 25 years and advises international humanitarian organizations on safety and security issues. Joel is also the author of Geocaching For Dummies and Secrets of Computer Espionage. Part I: Getting Started with the Eee PC. Chapter 1: Meet the Eee PC. Chapter 2: First Steps with the Eee PC. Chapter 3: Getting Connected with the Eee PC. Part II: Day to Day with the Eee PC. Chapter 4: Cruising the Internet. Chapter 5: Getting Down to Work I: OpenOffice. Chapter 6: Getting Down to Work II: Other Programs. Chapter 7: Eee PC for Kids. Chapter 8: Eee PC at Play. Chapter 9: Confi guring the Eee PC. Chapter 11: Eee PC and Windows XP. Part III: Adding Software to the Eee PC. Chapter 12: Installing Linux Software. Chapter 13: Popular Linux Programs. Chapter 14: Popular Free Windows Programs. Part IV: Hardware and Accessories for the Eee PC. Chapter 15: Expanding Storage and Memory. Chapter 16: Essential Eee PC Accessories. Chapter 17: Power to the Eee PC. Part V: Eee PC Advanced Topics. Chapter 18: Backing Up and Restoring the Eee PC. Chapter 19: A Real Desktop: Advanced Mode. Chapter 21: Customizing the User Interface. Part VI: Part of Tens. Chapter 22: Ten Eee PC Troubleshooting Tips. Chapter 23: Top Ten Eee PC Internet Resources. Bonus Chapter 1: Using Other Linux Distributions. Bonus Chapter 2: Ten Power Saving Tips.